The effort to make Skidaway Marine Science Day a ‘landfill-free’ event was largely successful, according to event organizers. Held on the campus of the University of Georgia (UGA) Skidaway Institute of Oceanography, the annual open house attracted nearly 2,000 visitors on Saturday, Oct. 26, but generated only nine pounds of unrecyclable trash. The event organizers used recycling and composting bins to collect and recycle materials in an attempt to reduce the stream of trash ultimately headed to a landfill. The event was sponsored by the UGA Skidaway Institute, the UGA Aquarium and UGA Shellfish Laboratory, which are both part of Marine Extension, a public service and outreach unit of UGA, and by Gray’s Reef National Marine Sanctuary and the Nature Conservancy. When the event was over, 57 pounds of recyclable paper, mostly napkins and hot dog wrappers, and 35 pounds of cans and plastic were collected. The compost containers held 10 pounds of food waste. The rest of the non-recyclable waste was composed of material such as duct tape, pipe cleaners, cigarette butts, garbage bags and diapers. Skidaway Institute scientist Clifton Buck has just begun a 57-day research cruise that will take him from Ecuador to Tahiti. He will be updating this blog with accounts of his trip. 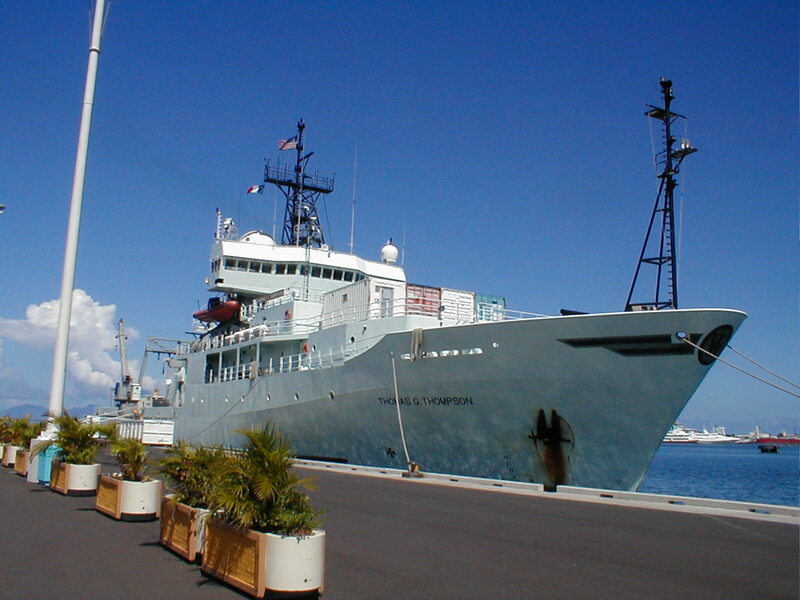 I am will be spending the next two months aboard the University of Washington’s scientific Research Vessel Thomas Thompson My shipmates and I are travelling from Ecuador to Tahiti as part of an international effort called GEOTRACES to better characterize the sources, sinks, and biogeochemical cycles of trace elements and isotopes (TEIs) in the oceans of the world. Trace elements are present in seawater at concentrations that are often far less than a part per billion but often play important roles in the ocean as nutrients, contaminants, and process tracers. The research implications will help us understand areas of study including climate change, the carbon cycle, ocean ecosystems, and environmental contamination. Our route will take us through three distinct regions of the eastern Pacific Ocean, each with their own distinct chemical characteristics. We begin the highly productive waters off the coast of Peru. This region is known as one of the finest fisheries in the world due ocean currents that bring nutrient rich waters to the surface by a process called upwelling. These nutrients support a great deal of biological production in depths that light can reach otherwise known as the photic zone. However, when the microscopic plants and animals living in the photic zone die they sink towards the bottom. As they sink, their organic matter is remineralized by respiration which uses the dissolved oxygen in the surrounding waters. The result is an area within the interior of the ocean that is very low in oxygen called the oxygen minimum zone or OMZ. Similar areas can be found off the coasts of Oregon and Louisiana in the United States. The low oxygen concentrations not only impact the plants and animals in the area but also affect the cycling of the trace elements as well. Next we will study the hydrothermal zone at the East Pacific Rise. The rise is an area of active volcanism on the sea floor and is a source for both particulate and dissolved metals to the interior of the ocean. At a hydrothermal zone, water within the ocean bottom can come into contact with magma and become incredibly hot. In addition to heat, the magma releases trace elements into the water. This super-heated water is then released through fissures in the crust creating features like “black smokers” which creates a plume of seawater enriched in TEIs. The magnitude of these sources is poorly understood and it is hoped that work on this project will help provide insights into their importance. We also hope to characterize the processes responsible for supply and removal of TEIs with the plume. Finally, we will traverse the northern edge of the central South Pacific gyre. A central gyre is a system of currents which flow in a circular pattern over thousands of miles. The gyre interior is one of the most nutrient poor (oligotrophic) regions in all of the world’s oceans. In fact, this area contains the bluest water in the world because there is so little living in it. My role on this project is to collect atmospheric samples. The atmosphere is an important source for trace elements to the surface ocean particularly in areas that are distant from the continental shelf and rivers. In future posts, I will describe the processes and equipment that we use to do this work. I will also try to give a sense of what life is like on a ship at sea for 57 days. Please check back often and leave questions for me in the comments section. I will do my best to answer them. 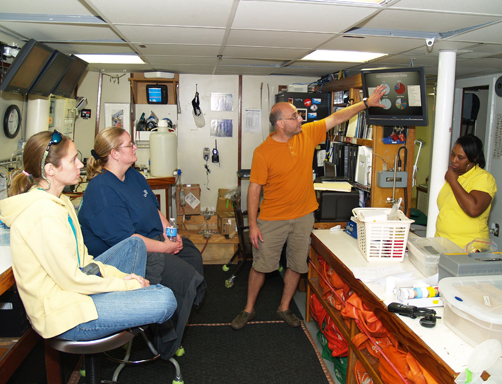 Note: UGA Skidaway Institute professor Marc Frischer just completed a two-day cruise on board Skidaway Institute’s Research Vessel Savannah. The cruise was a mixture of science and education. We left the dock on Thursday evening, October 3, and cruised overnight to a station out on the shelf. 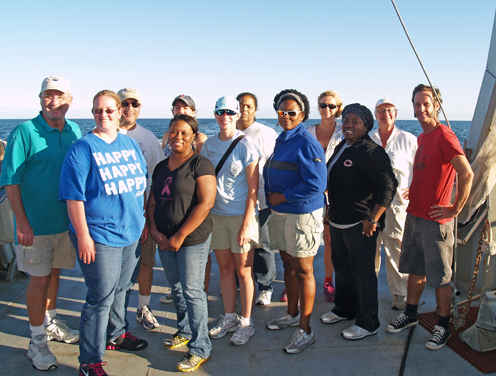 Friday was spent hunting doliolids and other plankton. After returning the dock for Friday evening, we left again Saturday morning to collect samples for a project investigating the black gill disease (BGD) in shrimp. Both days were also part of the GK-12 teacher program, so we had a group of K-12 teachers with us both days. Marc Frischer wrote this account of the cruise. his main focus is on Day Two of the cruise on Saturday. 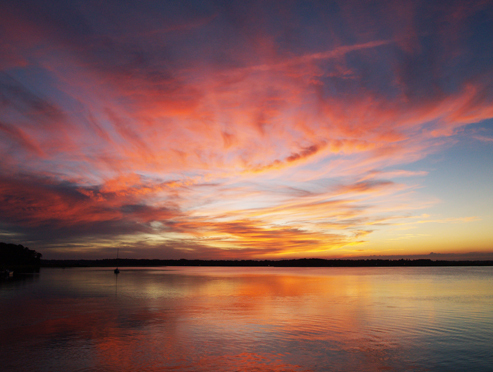 We had a beautiful sunset over the Skidaway River as we prepared to get underway Thursday evening. Marc briefs the science/teacher party just after getting underway Thusday evening. Several teachers were part of the science party on Friday. Just a quick summary of our small shrimp Black Gill Disease survey we completed on Saturday 5 October. The trip went very well. We had quite an interesting roster of cruise participants. We only ended-up with 3 teachers, but two of them brought a child. Some family members came along on Saturday. Also aboard from UGA Marine Extension Service were Lindsey Parker and John Crawford (Crawfish). 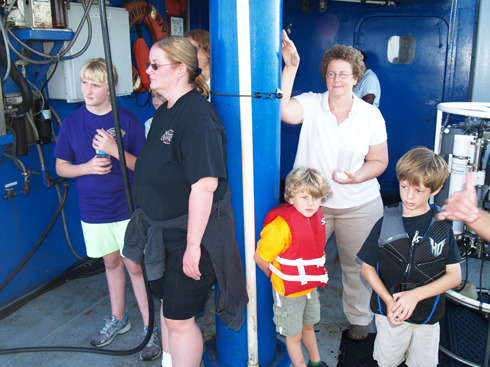 Mickey Baxley was also aboard but was filling in for crew on the R/V Savannah. I also had several of my lab members along and Mike Sullivan (Skidaway Public Relations) was along taking pictures and video. 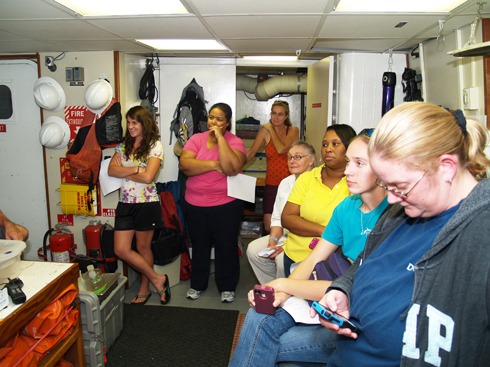 We started the cruise with a bit of a lecture and discussion about Black Gill Disease and our mission for the day. It was a lively discussion and was fantastic to have so many different perspectives in the room. Using the R/V Savannah we took replicate (2x) 15 min trawls just off of Wassaw Island just past the line of demarcation (offshore), in Wassaw Sound (in the Salt Pond area), and in the Wilmington River. 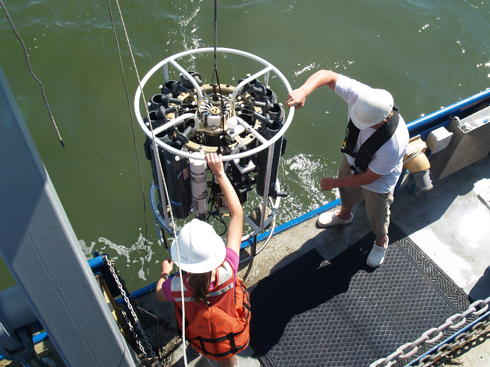 We tested for temperature and salinity before each set of trawls. 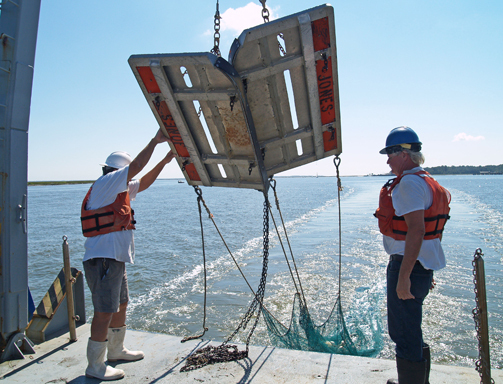 Deploying a trawl in Wassaw Sound. Ready to dump the load for sorting and inspection. Everyone gets involved sorting and counting. In general we didn’t catch very many shrimp. In the offshore tows we managed to catch 1 animal. It was a large male and did not have BGD. But in the Sound and River we caught a bit more. 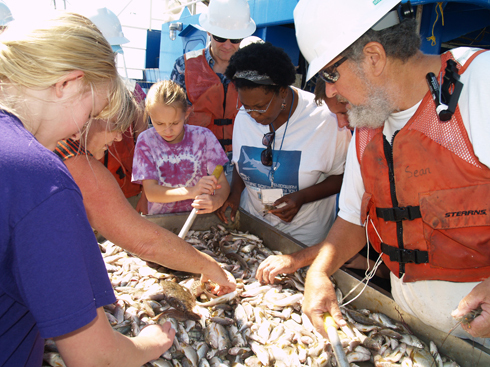 We counted and examined a total of 113 shrimp in the Sound trawls and 210 animals from the River trawl. 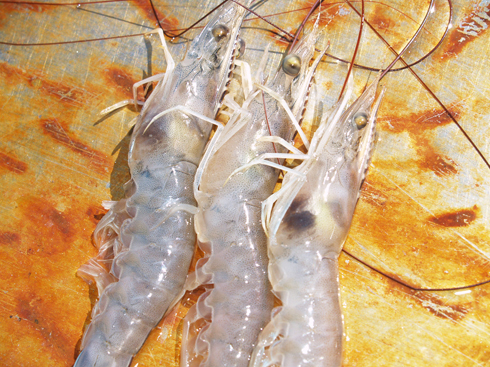 Three shrimp with black gill disease. The incidence of BGD was pretty high and was similar in the Sound and River. BGD infection rates ranged from 60-70% of the catch and 26-29% of those exhibited severe infections. A comparison of males to females suggested that females were more likely to be infected than males, but this data is a bit skewed because we caught mostly females. Approximately 70% of the catch was female in both the River and Sound trawls. We collected and kept alive 20 shrimp with BGD and 20 that did not seem to have BGD (though I suspect they all do to some degree). These we transferred to holding tanks at SkIO and will do transmission studies with them next week. The first priority will be to look at transmission from heads of shrimp with BGD. We also collected samples for DNA analysis. That’s about it. If anyone wants the data I’ll be happy to share it. The science crew on Friday. As the Gulf Coast continues to recover from the effects of the 2010 Deepwater Horizon oil spill, scientists from the University of Georgia Skidaway Institute of Oceanography are continuing to look into the long-term effects of the spill on coastal marine life. A team led by Skidaway Institute professor Richard Lee recently completed preliminary work into the effect dispersed and emulsified oil has on blue crabs and shrimp. 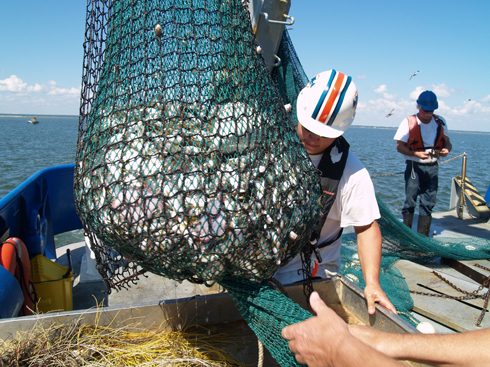 The project includes vital information from fishermen and crabbers in the Gulf. Lee and his research associate, Karrie Bulski, are exposing blue crabs and grass shrimp to emulsified oil in sediment and then determining how this oil affects molting, or periodic shedding that allows shrimp and crabs to grow. To test this, emulsified oil is added onto sediment inside the tanks that house the crabs. The crabs are also fed squid that has been contaminated by the emulsified oil. Preliminary research results show egg and embryo production was reduced in female grass shrimp exposed to food and sediment infused with emulsified oil. Working with Anna Walker, a pathologist at the Mercer University School of Medicine, they found that blue crabs exposed to emulsified oil showed changes in their blood cells, especially cells related to the immune system. Lee and his team speculate that the immune systems of those crabs may be compromised, making the crabs more susceptible to infection and disease. Researchers are also testing effects of oil treated with dispersants. In the case of the Deepwater Horizon blowout, millions of gallons of chemical dispersants were sprayed over the surface and subsurface of the Gulf. These chemicals disperse the oil into micro-droplets. In this project, dispersed oil droplets are added to petri dishes containing embryos of crabs and shrimp to test their effects on development. Preliminary results show grass shrimp embryos exposed to suspensions of dispersed oil affected the hatching and molting of the shrimp embryos. Work on this project by Sook Chung at the University of Maryland indicates that molting hormones and molting regulating genes are affected in grass shrimp embryos exposed to dispersed oil. Lee is working with scientists at the University of Southern Mississippi to provide the outreach portion of the project, which includes working with crabbers, fishermen and others in the Gulf ecosystem to understand the long-term effects of the spill and discover ways to manage them. 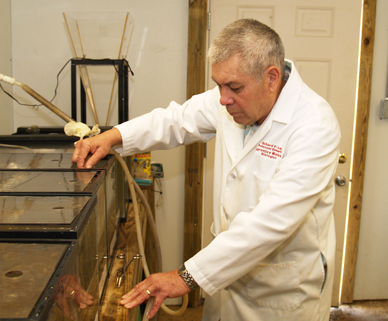 Richard Lee works with the tanks containing crabs and grass shrimp in his laboratory at Skidaway Institute of Oceanography. So far, workshops have been held in Ocean Springs, Miss. and included charter boat captains, crab and shrimp fishermen, eco-tourism operators, and even teachers and artists from Biloxi, Miss. and Bayou La Batre, Ala. According to Lee, one issue facing the Gulf coast communities is rumors about seafood safety are often much worse than reality. In Louisiana and parts of Mississippi, where a lot of the oil came ashore, there is a perception that people should not eat the seafood there. But, there is very little evidence of any contamination in commercial shellfish. Lee and his team plan to complete their project and publish their results early next year. The study is funded through a $500,000 grant from the Environmental Protection Agency. 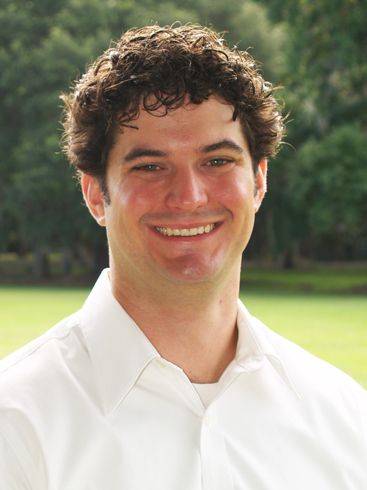 The team includes Chung from the Institute of Marine and Environmental Technology at the University of Maryland, Harriet Perry and Christopher Snyder from the University of Southern Mississippi’s Gulf Coast Research Laboratory, and Walker, at the Mercer University School of Medicine.